Weirdo’s Lunch. Sorry. Not Sorry. Ever heard of a cheese-less Pizza? Ever heard of a person who doesn’t eat cheese? I’m so happy to finally find a cheese-less Pizza, and to be able to eat Pizza without having to cover my nose just so I could not smell the cheese (eww). So this restaurant, Fratelli La Buffala is the amazing provider of this heavenly cheese-less Pizza. I have not visited them yet (and how the hell did I get this Pizza??? Doesn’t matter.) but will do so some other time. It’s not even a Pizza without cheese! And I’m like. IDFC. It’s in a Pizza Box so its a freakin’ PIZZA! Ditch diet. I had 3 slices. Wow! This is really interesting. Now I can proudly say I know a human living on this planet who only eats a cheese-less pizza. ha ha ha. I’m an endangered human being then? LOL. Para sa mga may gall stone pala yan… Walang cheese. Ano lasa? bakit ka nandidiri ateeeee? ako nga, gusto ko nagooverflow sa cheese eh. hahaha! ha ha ha ha. natawa ako sa PEANUT BUTTER INTOLERANT bwahaha. Ohmygosh! The second person I know who hates cheese. What’s wrong with you guys?? Lol. Btw, is that Jimmy Fallon? Good for lactose intolerant folks. Why do you hate cheese???? I’ll buy you cheese for valentines. You’re welcome. LOL! 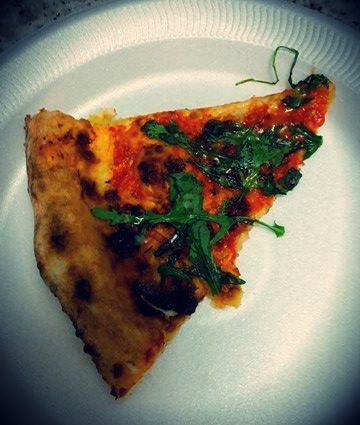 Nakakatawa na nakakapraning…revolutionary is the word for this kind of pizza.